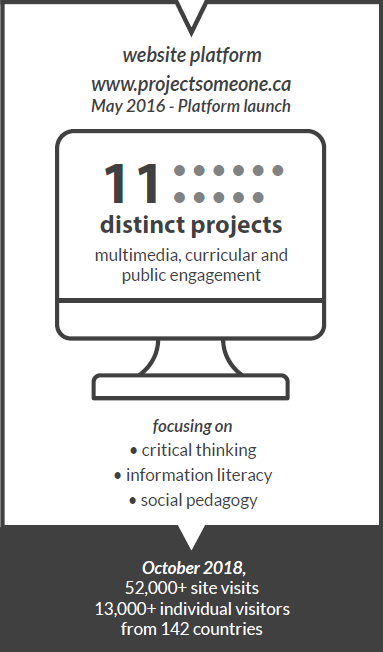 Web portal created in May 2016 with 11 distinct multimedia, curricular and public engagement projects focusing on critical thinking, information literacy, and social pedagogy. Objectives of building awareness, creating spaces for pluralistic dialogues and combating online hate. 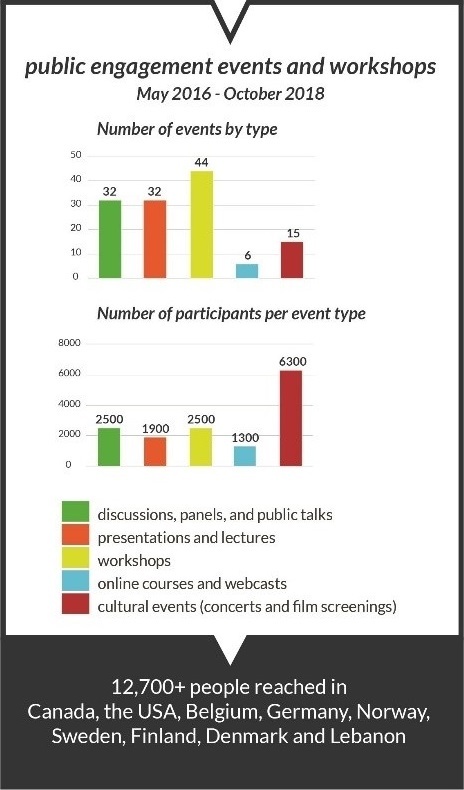 Training key stakeholders in schools, public safety, criminal justice, NGOs, social service providers – over 12,700 reached via workshops and public engagement events in Canada, the USA, Belgium, Germany, France, Norway, Sweden, Finland, Denmark, and Lebanon. The SOMEONE (SOcial Media EducatiON Every day) initiative was launched in April 2016. It has been funded under Public Safety Canada’s Kanishka (2014-2016) and Community Resilience Fund (2017-2019) programs as well as Global Affairs Canada’s Counter-Terrorism Capacity Building Program​ (2018-2019). It consists of a web-based portal of multimedia materials aimed at preventing hate speech and building resilience towards radicalization that leads to violent extremism. The materials target youth, school and community members, public policy officials, as well as the broader public by focusing on the development of critical thinking and information literacy skills, and encouraging democratic dialogues in online and offline spaces. The initiative has seen the rigorous development and evaluation of curricular activities for elementary, secondary and post-secondary institutions. 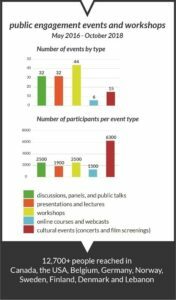 Such activities include: first-person narrative documentaries, textual and multimedia social media feeds, visual art-based public pedagogical materials, graphic novels, public panel discussions, lectures and workshops, academic articles and conference papers, and descriptions and workshops on novel research methodologies. Our work is framed in principles of social pedagogy which encourages the inclusive adoption of mobile and digital media by members of the public to create alternative narratives to divisive and violent messages propagated by hate groups.